Where do I use my Graham and Green voucher code? Discover a huge range of furniture at Graham and Green that includes beds, bedside tables, bookcases, storage units, chest of drawers, wardrobes, coffee tables, console tables, desks, dressing tables, dining tables, drink trolleys, outdoor furniture, sideboards, media cabinets and cupboards. As well as this you’ll also find bespoke sofas, ready to ship sofas, armchairs, desk and dining chairs, footstools and ottomans, poufs, bean bags, stools and benches. If you’re looking for soft furnishings you can also find cushions, floor cushions, quilts, bed linen, seat pads and throws and blankets as well as bath mats, sheepskin rugs, runners, vinyl tile mats, hand knotted rugs, Moroccan style rugs and patchwork hides. As well as an extensive range of furniture Graham and Green also stock a plethora of home accessories like all kinds of lighting including bathroom lighting, chandeliers, ceiling lights, string lights, floor lamps, lamp shades, neon lighting, outdoor lighting, table lamps and lighting accessories. There’s also a wide variety of mirrors like floor, table and wall mirrors as well as hardware like bathroom accessories, coat racks and hooks, door knobs, handles, door stops and doormats. On top of their already impressive range of homeware and furniture, Graham and Green also provide a huge selection of gifts for men, women, kids and for the home. All these gifts are extremely affordable and of the highest quality, sure to surprise and warm your recipient's heart. In the gift section, you can also find quirky gifts, wedding gifts and even gift vouchers, which allow your friends, family and loved ones to select their own products without spending a penny of their own money. Graham and Green boast a fantastic finishing touches section on their website where you can find fabulous little extras that will complete each room in your home. The products in the finishing touches section include baskets, candles, candle holders, Christmas decorations, clocks, decorative accessories, faux flowers and plants, fireside and fire pits, home office products, products for kids’ rooms, photo frames, plant pots, vases, prints, wall art, quirky finds, scented candles and toiletries. All these home accessories and little extras come in a variety of styles and colours, and are extremely affordable, allowing you to accent your decor in whichever way you want, without spending a fortune. If you’re looking to accessorize your kitchen and dining room then take a look at the kitchen and dining section at Graham and Green. Here you’ll find an array of stylish ceramics, tableware, cutlery, entertaining equipment, glassware, kitchen accessories, placemats, coasters and trays in a variety of colours, styles and patterns. All of the products available in this category are made with the highest quality and supplied to you at the most affordable price, allowing you to fill your home with stunning pieces that will be the envy of all your guests. Please click on the Stores icon at the top left corner of our home page to find the contact details and opening times of all our individual stores. With years of experience in the furniture and home industry, Graham and Green stock a huge supply of high-quality home accessories and furnishings that are extremely affordable and regularly updated. 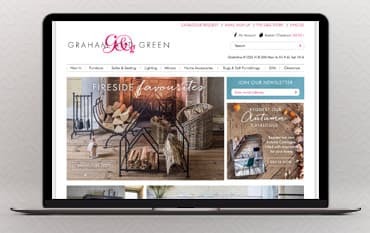 In the Graham and Green online store, you will find a whole host of products including furniture for every room of the house, sofas, lighting, mirrors, home accessories, rugs, soft furnishings and even gifts. Shop online at Graham and Green for all these products and use a Graham & Green discount code from us to save money on your order. You can also discover downloadable catalogues, a great clearance section and Prezola wedding gifts.